What a contrast: a completely wasted day on Thursday, but a Le Mans celebration day on Friday. 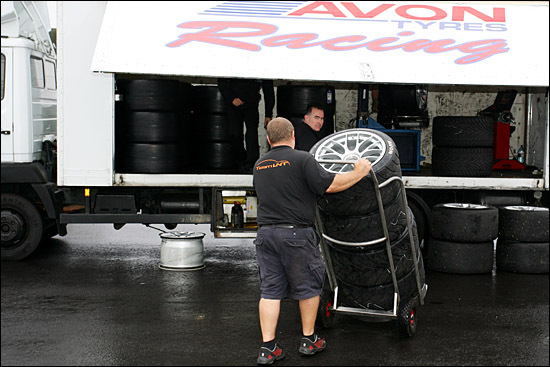 So yesterday, September 14, was supposed to be the first opportunity to try a new Avon slick for the Esperante, but the car never left its garage. “A dry line started to appear before lunch,” related Richard Dean, “so we had the car warmed up, all ready for the green light – and then a freak cloud came over and flash-flooded the track. That was it for the day. 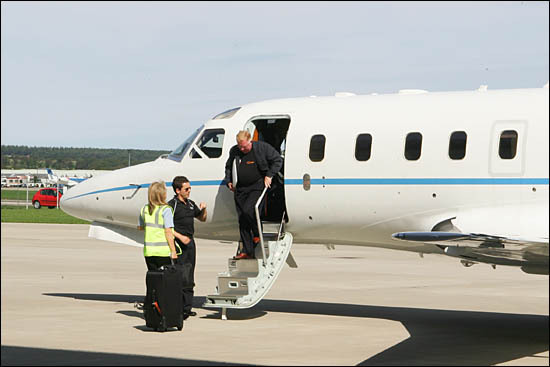 24 hours later and Team LNT was at Leeds-Bradford Airport, to welcome a very special visitor. “Dr. 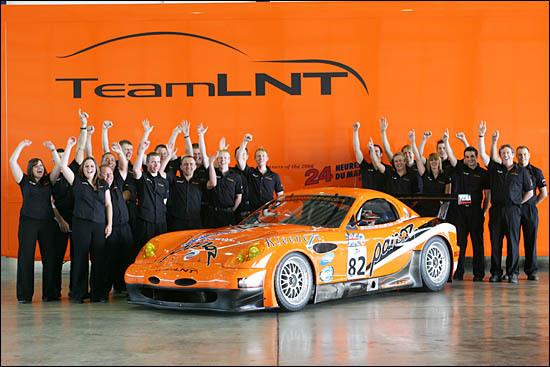 Don Panoz wanted to recognise the efforts of everyone who was involved in winning GT2 at Le Mans,” continues Richard Dean. “Lawrence (Tomlinson) had been playing golf with Don in Scotland, and Don said he wanted to present something, in person, to every member of the team who was at Le Mans in June. So there we were, all waiting for the jet to land – it was a bit like waiting for the President! 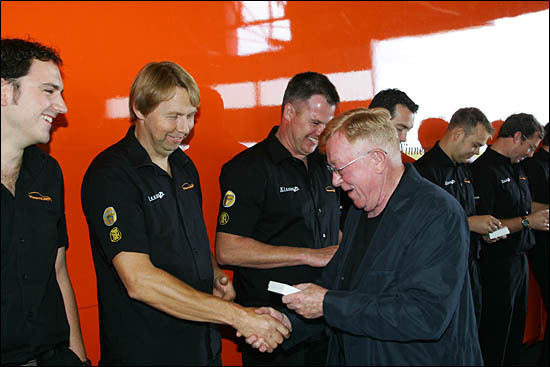 That Le Mans victory clearly meant an awful lot to Dr. Don Panoz. 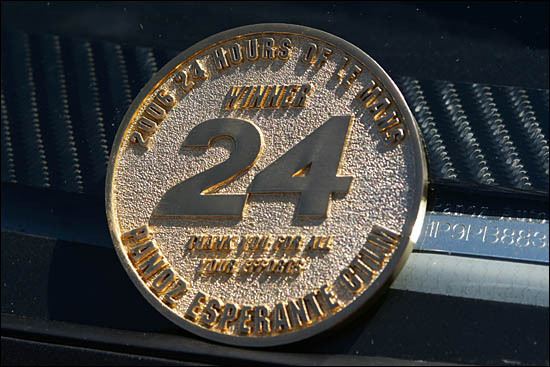 The Panoz Esperante was there of course, together with the team’s truck, and these images are a permanent reminder of a very special day. 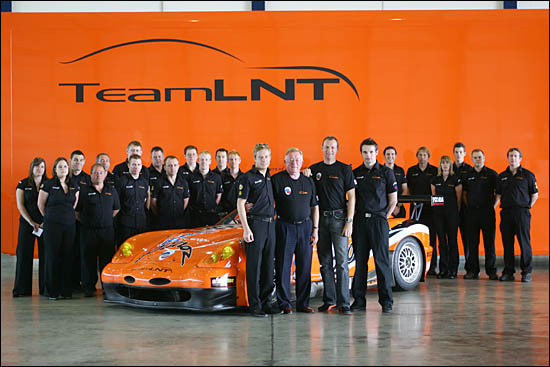 It’s not over yet though: Don Panoz will be dining with the team tonight, and staying in Leeds overnight. 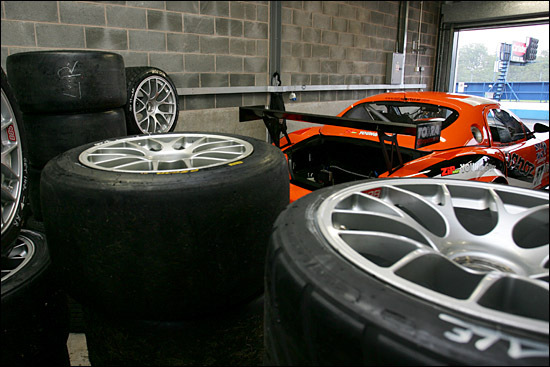 We’ll endeavour to catch up with him at Road Atlanta within the next 12 days or so – and LNT at Silverstone before that, for what could be the deciding round of the British GT Championship.